20 on/off settings 16A resistive, 8A inductive. Fits 35mm back box. Shortest switching cycle 1min. 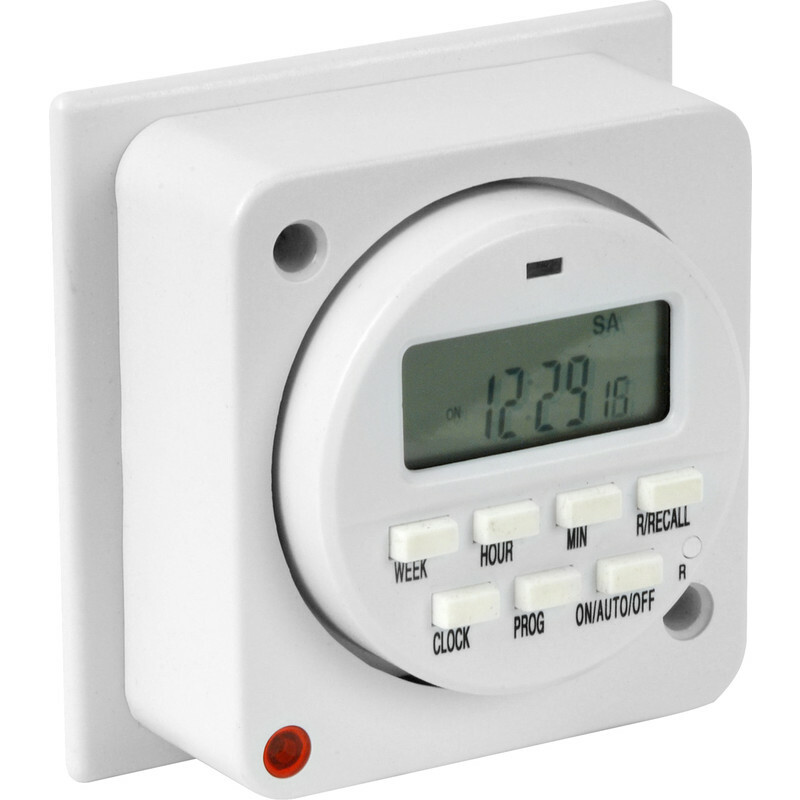 7 Day Electronic Lighting Timer 16A (8A) is rated 4.5 out of 5 by 19. Rated 1 out of 5 by Trader from Useless Connected two of them,none of it working. Lights blinking on one of them. The other one even haven’t turned the light on. Rated 5 out of 5 by jjohnt57 from Uncomplicated Timeclock. I required a basic time clock to operate once a day, seven days a week to switch on the washing machine and tumble drier (via a contactor) at the latter end of the "off peak" period. Rated 5 out of 5 by Andy from Compact design Bought to automate an outdoor floodlight. Easily replaced the wall switch faceplate with this, simple to program with many options as well as manual override. Rated 5 out of 5 by Simon88 from Easy to fit, works well, good for price. Bought this for an outside light (timer unit installed inside) does the job and was really easy to fit and programme. Rated 5 out of 5 by Strappz 67 from Great product for less Installed to switch lighting circuit on and off at set times. Well made and designed to make installation easy and quick. Programming easy to complete with the added option of 7 different time settings. Not the prettiest thing to have on the wall but extremely functional and excellent value for money. Hopefully will last for the next few years. Rated 5 out of 5 by Hontreas from Easy to use and good price Bought this to control my outside lights. Fits in a standard box and is easy to programme. Rated 5 out of 5 by Peld from Great little timer. I have now installed two of these timers to control lights at various points around the garden. Easy to install and easy to set up.